RAUH-Welt BEGRIFF is an ideology born from grass-roots racing in Japan. This ideology has grown into a world-wide movement in the automotive design and tuning culture. Nakai personally transforms every single Porsche for the customer and this movement has finally reached down under. "The worlds first coffee table book on RWB focusing on the life after birth of RWB Southern Cross. 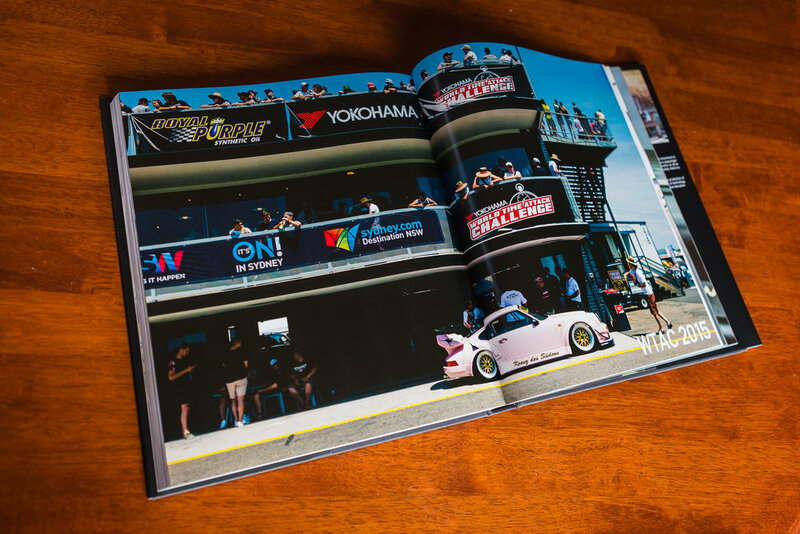 This publication measures 290mm x 240mm with 300 pages of high quality photography, taking you up-close-and personal to the build process and beyond from Nakai-san's arrival to the World Time Attack Challenge in Sydney." I was involved in this amazing 12 month project with RWB Australia, to document and preserve the very 1st RWB Porsche build in the southern hemisphere. I worked together with two other photographers as we took turns visiting workshops around the state to capture different aspects of the build process, paying special attention to the smallest of details. Our team also travelled around Australia to do photography and filming on the very special car, the short film was released at I-MAX Melbourne on March 25th 2017. For more info on this film, please visit www.rwb.film. The second instalment of the series publication dwells deep into the people, places and principles of the Rough World zeitgeist, from preparation to participation in the Idlers Club Japan 12-hour Endurance Race. As the saying goes, “If you can’t afford to lose it, don’t race it”. Armed with great friendship, support crew and a huge ego, the cars that broke in the race re-emerged a year later better than ever. Volume 2 also brings you to the figures of RWB Japan whom without them we cease to exist - from our head mechanic's secluded workshop in Tokyo to the paint alchemist's home who maintains a full fleet of Rough World AE86 drift cars in his driveway. Over 300 pages and 430 photographs of air-cooled wide-body RWB Porsches wrapped in between a custom-dyed cover to the tone of Nakai-san's race cars, This book is a must-have to any RAUH-Welt family and fan out there. This publication measures 290mm x 240mm and is 2.5 kg / 5.5 lbs heavy. First Hardcover edition is numbered and printed to 964 copies only.